What enthralls me most about Cynthia Hartling’s paintings, besides their punctum --the formal piercing that Roland Barthes described-- is their thoughtful, compulsive quality. I don’t know any other painter that can continually return to a painting, overwork it, and somehow make it better. There is a tension between this almost neurotic continual return to the canvas and an ability to recognize the piquant asymmetry of a piece that is finished but still alive, just previous to the moment that it would be smothered, just after the moment when it would be merely tasteful. All of Cynthia’s paintings do have a punctum; some even make me dizzy. Her attack is painterly, intelligent, fluent; one can immediately see the roots of her accomplished sense of how to build color on a canvas, how to layer, cover and reveal, the punctuation of accident, drips and crackling, yet there is no agenda in her work, never a sense that she has “decided” to do pure abstraction, or narrative, or figurative abstraction, but that all these are at her disposal towards a more interior aim. 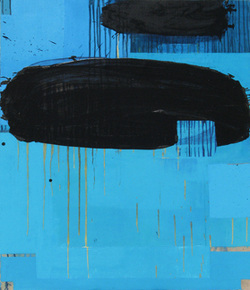 Her work feels in part diaristic, as if she is working some immediate thought or emotional process out into the world. She does not use tape even to achieve lines that she wants to be perfectly straight, and this seems to be part of an urge to work her unconscious and conscious minds directly onto the canvas with as little as possible interference, in a direct line from mind to arm to hand. At times she scrapes at the work, removing paint like someone picking a scab. Again and again one feels the physicality of the work, not in a deliberate Pollock-like stance but in an intense and tangled relationship she has with painting, as if she would like to actually climb inside the work, can never get quite close enough to it to please her. A passage on a particular piece looks like a moment from Cynthia’s life; a painting is a three-dimensional fugue of moments; a day, a week, a month spent under a particular sky. Then she returns and works over the canvas like someone chewing over a memory, adding the dimension of time, reflection or even obsessive noodling. It would be impossible to talk about Cynthia’s work without mentioning the way she uses color and light; color is the open heart of her work; there is always something about her pieces that looks cracked open and vibrantly bleeding. Her impetus seems to emerge out of a dialogue with art’s masters of light, from Giotto onwards, and the receding and floating planes of her canvases’ could as easily recall one of Piero della Francesca’s cityscapes as the push/pull of a Hans Hoffman or a Rothko. But I’ve also heard her talk about being in various landscapes and how the light changed the colors she was using, as if the continuity of her being from mind-to-hand is a porous material through which her life moves out onto the work. The conflict in it comes out of a tension between this kind of immediacy and the subsequent interference of her psychological processes, which to me is represented by that return to the canvas, a kind of anxiety with which she attacks the more documentarist or “pure” mid-20th century impulse. Her paintings are Proustian edifices, made up as much of Cynthia’s experiences of her world and thoughts as of her lineage in 20th century abstraction. The glimpses of layers underneath seem even more involuted, expansively so, like an anatomical interior revealing increasing complexity. Cynthia is applying the scalpel, opening up the body to show the mystery inside. More than anything else, a thought process is made available on her canvases’, a document of a life spent through time, observation and feeling. This will be Cynthia Hartling’s third one-person show at the Janet Kurnatowski Gallery. She studied at Cooper Union, NY, where she received a BFA, as well as at the Istituto Statale d’Arte in Urbino, Italy, and SUNY New Paltz. She has been the recipient of the Milton and Sally Michel Avery endowed residency for visual arts at Yaddo; the Barbara White endowed painting award at Vermont Studio Center; and visual artist fellowships at Fundacion Valparaiso, Spain; Art Farm, Nebraska; and Jentel, in Wyoming. Her work has appeared in numerous group exhibitions throughout New York and London. For more information or images please contact Janet Kurnatowski.